Poʻipū Beach Park is located in the community of Poʻipū on the southern coast of Kauaʻi island in Hawaii. The beach is a park has lifeguards provided by county of Kauaʻi. There are swimming and snorkeling areas, and a surf break over a reef for experienced surfers only. It can get crowded on weekends. It was ranked as the best beach in America by Florida International University professor Stephen Leatherman, "Dr Beach" in 2001. It is located at 21°52′24″N 159°27′15″W﻿ / ﻿21.87333°N 159.45417°W﻿ / 21.87333; -159.45417Coordinates: 21°52′24″N 159°27′15″W﻿ / ﻿21.87333°N 159.45417°W﻿ / 21.87333; -159.45417. Just west of the county park are the Moir Gardens on the Kiahuna plantation. 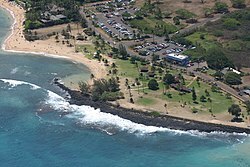 ^ "Poʻipū Beach Park". Kauaʻi explorer web site. county of Kauaʻi. Retrieved 2010-02-05. ^ Stephen P. Leatherman. "America's Best Beaches". DrBeach.Org web site. Archived from the original on January 6, 2010. Retrieved 2010-02-05. ^ "Moir Gardens at Kiahuna plantation". web site. Retrieved 2010-02-06. "Aloha from Sunny Poipu Beach". web site. Poipu Beach Resort Association. Retrieved 2010-02-06. This page was last edited on 13 September 2016, at 03:06 (UTC).